I have to feel very ambitious today to write an article in this blog about street food in Jakarta. It's pretty much like planning to write about French cheeses in 500 words: Too much information, too little time... So I won't aim to be exhaustive, but only give a short overview of the street foods in Jakarta. A huge majority of Indonesian never set foot in a restaurant, and even a meal in a Rumah Makan (basic eatery) is not always common. However, eating in street stalls, because it is very cheap, can be considered almost as common as eating at home. In fact, you will see in Jakarta's smallest streets that a woman cooking at home may sell some of her dishes, while buying another dish to someone's other house. 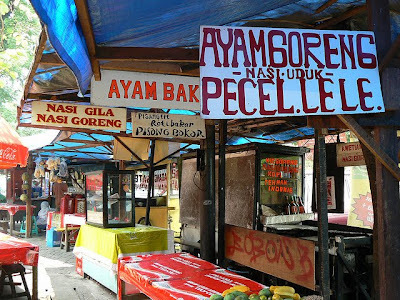 Street food is one of the most authentic Indonesian experience you can have in Jakarta, and with so many places to choose from, it is also the easiest way to integrate for expats and practise your bahasa Indonesia. You will sit elbow to elbow with the other customers and since expats are not always a common sight, you won't have any difficulties to engage in some chitchat. Eating in the street is also quite lively: You often have some singers or musicians trying to make a few rupiah as well as street vendors approaching you.. So what are the best areas in Jakarta for street food? - Jalan Sabang, about 1 km North of Plaza Indonesia and 200 meters from Jalan Jaksa used to be a very active spot, almost 24h/24h, but the City Council has made it harder for street food stalls to stay on the sideway, and now it is very quiet. If you are a tourist, there is a big chance that your hotel is near Jalan Sabang so don't hesitate to grab a cab, it is perfectly safe and everyone knows where it is (see my Safety in Jakarta guide). 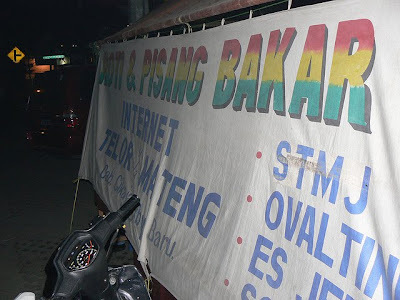 - Not far from Sabang, in Menteng, you can try Jalan Sidoarjo. This place is popular at night especially with young people, who come to enjoy "Anggur Hitam" (black wine). - Another street, popular to eat seafood, but more expensive that average, is Jalan Kendal, just after Jalan Blora. - For those who like Chinese food, my favourite is Jalan Pangeran, in North Jakarta. It is extremely busy, but cheap and excellent. Jalan Mangga Besar is also famous for its Chinese food, and also becasue they have some unusual dishes: Dogs, Turtles, Cobras, Frogs, etc.. They stay open 24h in that area too. - Some areas worth mentioning as well: Blok S, Blok M, Jalan Tebet, Pasar Festival in Kemang. Actually, once you'll have settled in a neighborood, I hope you can try and explore some of the stalls around your house. If there is a place we should know about, please share with us! 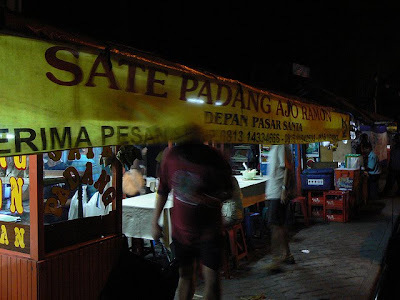 The Kaki Lima (5 legs) are small wheeled carts that usually only offer a few kind of dishes: Bakso (meatball), soto (soup), ketoprak (rice with tofu), etc.. and also desserts and drinks: Pisang Goreng (fried banana), fresh juices... The portions are small and you are served quickly since the food has already been prepared. It's extremely cheap, Rp. 3000 to 10,000. You may have to pay a few thousands rupiah more if you look like an expat, but consider it as a tip! If you are looking for a full meal, you can also have, usually half on the sidewalk, half on the road, some stalls with plastic chairs. They have very colourful banners with a list of all the dishes they prepare. It is a bit more expensive, from Rp10,000 to Rp20,000 for a meal, plus Rp5,000 for a drink. In Jakarta, the ones you are the most likely to see are Nasi Uduk (Rice cooked in coconut milk), Pecel Lele (catfish), Ayam Bakar (grilled chicken), Ayam Goreng (fried chicken), and of course Mie Goreng/Mie Rebus (Fried/Boiled noodles) and Nasi Goreng (fried rice)! In all these places, you can always have take-away, they will put your food inside a paper and you can eat it at home in your own plates if you worry about hygiene. If you don't like spicy food, really insist in the fact that you want no "cabe" at all (hot pepper) because saying" not so spicy" for an Indonesian and an expat is not the same thing! At last, Jalan Sabang is actually famous for its "sate", a sort of chicken or goat kebab with a spicy peanut sauce. Not my favourite, but surely one of Jakarta's street food most popular dishes! All the great photos on this article were taken by Peter Cuce, thanks to him for letting me put them in the blog. You can visit his website here! 35 comments to '' Street Food In Jakarta "
great posting. I'm going to eat on the street right now. I love to eat at loewy , tratorria, and few other ...but once in a while a street food is so yummy !! i came back today in jakarta ..i get a mie ayam behind the ambassador mall , 8 000 rp , so good ...i had the same pleasure that in fancy place.. for the people afraid to get ill , i think it is stupid...the risk is there too in a big restaurant ! not been in street food it is not have been to indonesia ...i forgot to mention that this people are 95 % time so nice and friendly !! I saw today that all the street food stalls in Jalan Sabang are gone!! Anyone knows what happened?? I don't know why sate(satay) sabang is famous,maybe bcoz it's quite cheap compare to restaurant nearby,but really with the same amount i can have more juicy,tender meat and (most importantly) cleaner place.Seriously,i have to hold back my tears watching numerous cockroaches crawling on the tables and watching the waiter kill it in front of me.I'm not exaggerating here.Well at least it's tiny species not the big one from sewer.I will run straight away. But the food stalls in the middle of Jalan Sabang is better in term of cleanness, though i don't find any fave food here. Anyway, with 25.000 i can eat indonesian food inside Sarinah Thamrin building which only a walking distance from Jalan Sabang and not worrying to be bugged by persistence street singers.. But then where's the adventure value in it, rite ? Enjoy! I am an Indonesian who lives in the Netherlands for over 40 years, but I visit Jakarta at least once a year because my mom is still living there. Every time I was there I went to Krekot nearby the railway crossing to eat bakmie Kota Kembang. 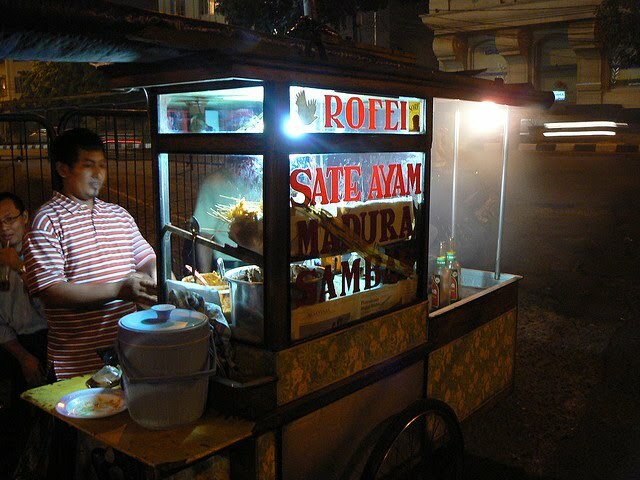 Believe me, the bakmie there is the best you can get in the whole Jakarta. This is not only my opinion, but the opinion of those who really fancy eating bakmie. It's cheap and very very delicious, the owner is a friendly Chinese lady, so you can be sure you won't get diarrhea. Because of the popularity among the citizens you have to come not later than 11:00 a.m., after that time you won't get the bakmie anymore, it's finished. Opening time is only in the morning till 11:00 a.m. You must try it once, and you will keep coming back, it's worth it. Thank you for the info ... will surely try it once ... at the least .... can't wait !! You should try to go to Balai Rakyat, South Jakarta :) and go for the Nasi Uduk Mas Dikun or Soto Kaki Kambing. You should try Jalan Pecenongan. Lots of yummy street foods.. The price is a bit higher than the other place tho'..
Also, try "sate diet" at Bulungan. They serve sate made from chicken breast with no fat at all. Pure chicken breast. SUPERB! Great street for street food. Really comes alive at night! You should go to Muara karang. A lot of Chinese medan cuisines there and they are so delicious. Friendly vendors with delicious street food at reasonable price.I love them all. Those durians in the picture make me feel like finishing it off.Reminded me of Mangga Besar. you gotta try seafood at benhil (bendungan hilir). average price with tastier and bigger seafood (yes, literally 'big' in quantity) than other seafood street food at Jakarta. I support Mikhaela about Jl. Pecenongan! I love that place! Also, if you have some Indonesian friends, ask them to go to Muara Angke fish market. But you must go there after midnight, when the fishermen go out of the sea: buy your own fish, mussels, prawns and go to the Makassar restaurant there. They will prepare them for you for a small money, will bring you cold beer, fresh coconuts and will give you a choice to seat Indonesian style or at a real table. Fantastic place for fish and seafood lovers! 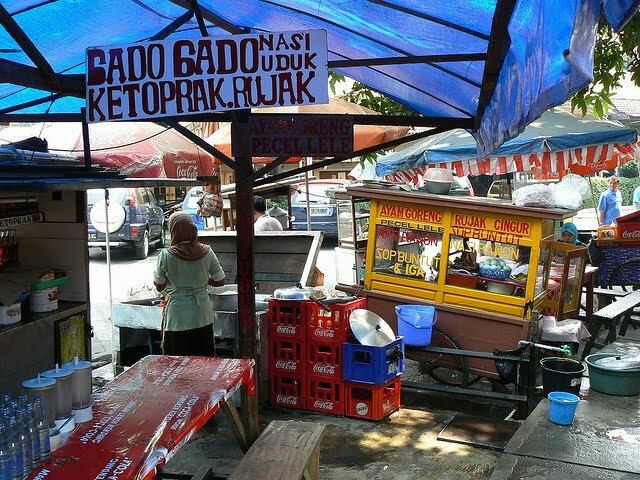 There are conflicting stories about the health factor of Jakarta street food. Some say it's the only way to eat and it's entirely safe, while others say it's as bad as street food in India which WILL give you Delhi-belly. How's the hygiene at the street vendors? Can a visitor eat from there without risking an upset stomach? I've eaten LOTS of street food in Thailand (Bangkok, Pattaya, and Chiang Mai), and never had any problems. But I refuse to try in India! To BrianInCapeTown and guys who think about this.. It depands on the condition of your body ,strength of the meal ,fresh or not of material, mood of cooker at that moment.... no absolute. Just try and ,if you are survived, you open the door of a new world.! To those worry about diarrhea, as a rule of thumb it is safer to eat hot food meaning those boiled or grilled. So mie ayam, soto, sop kambing is safer because they are served in hot soup. 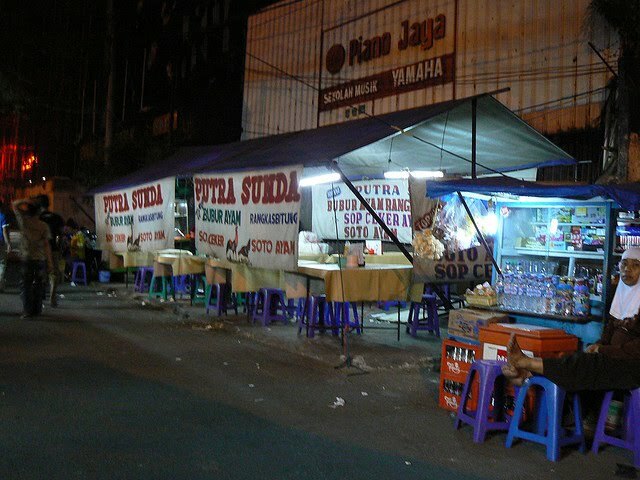 The best street for delicious food in Jakarta is without hesitation Jalan Mangga Besar, especially after 8pm. There is a strip with at least 100 food vendors who sell absolutely everything you can think of. Trust me and you won't regret it. You should try "sate & sop kambing H. Mansur" at jl. KH. Abdullah syafei also known as casablanca. One of the best lamb satay and lamb soup in jakarta. Cheap too.